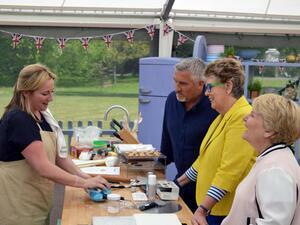 The Great British Bake-off returned on Channel 4 last night. Talk about shifting it up, Biscuit week trading places with Cake week! I think I would have coped better if they redecorated the tent. 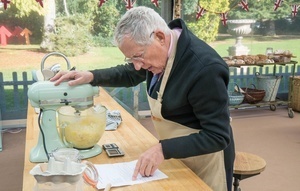 Admittedly I did have an uncomfortable inkling on Monday when I retweeted Bake Off’s official little vid for shortbreads and wondered weakly why t’wasn’t a cake recipe when I did the 1 sleep to go thing. 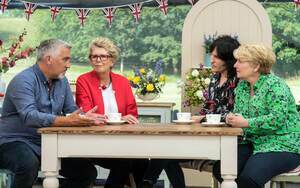 As with other years, I purposefully do not follow all the online chatter about Bake Off, simply because I prefer to go into each heat completely ignorant and open minded, and will continue that same policy this year. 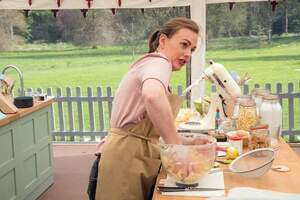 I only follow the Hollywood @judgebakeoff as a vocational obligation, and now in recent weeks @BritishBakeOff; and I will endeavour to keep it at just that. So, week 1, Bikkies. 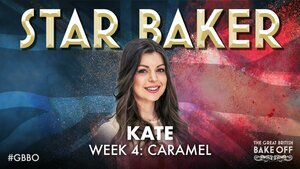 Firstly, the opening Bake to the Future didn’t work for me and I hope we’re spared these uncomplimentary intros over the next 9 weeks, but I doubt it; there I’ve said it. Secondly, remind yourselves of my view on Biscuits. I do think doing Biscuits on week 1 was unfair and it should have been cake; if they really wanted to shuffle the formula a bit, maybe put Bread week ahead of Cake. They are the main occupation of the home baker and that’s what we should have been allowed to consider from all 12. The Technicals in particular, have always introduced something we, the home baker, have either not known of or even considered attempting; so last night;s Wagon Wheels, was a great opportunity to try something we’ve only ever shop bought and try and make it smart and artisan. OK it’s not for a beginner, but Biscuits aren’t anyway, so if you’re nervous use Stacy’s fluff recipe from last year’s Bikkie week. One more bites from the bakes last night; boiled & shifted egg yolk in shortbread? Yep, I’ll give that a go meself so thank you Briony . So, what of the contestants; There’s France-born Manon . She’d been on a cooking show before. I never saw it, I never heard of it, so I’m comfortable saying she’s one to watch. Ruby was trying too much to be a character but isn’t irritating; Yet. And isn’t it great to have a flake back in the tent? I also think Kim-Joy is one to watch. Overall, I think we’re in for a great season, although I’m very unsure about Vegan Week. Yep it’s a thing. No Handshakes, but I definitely got a sense that this year The Hollywood appears to have got attached to all the bakers. I just wish Pru would shurr’up about calories tho’. Posted in Misc and tagged frilly keane, Great british Bake Off at 2:38 pm on August 29, 2018 by Frilly Keane. I really feel sorry for people that watch this poo.. I really feel sorry for the people who have to sit and listen to you whinge but you know, that’s life. I think what I’m trying to say is, get over it. Opinions are like bottomyboops Dermie, everyone has one and it’s shortsighted and silly to boopity boop other peoples tastes in entertainment when yours are probably as unfathomable to us. I am completely bereft of any notion of how people derive enjoyment from this but each to their own and this is wildly popular so I accept that I’m just not on board the zeitgeist here. Why bother pulling down the column at all? What’s your problem with Gemma O’Doherty Frilly? is she cribbing about not been on Bake off now as well? first mosquito bites. now this. Don’t turn it around on me, you lumpy d-bag. 1. Noel’s hair is horrendous. 2. Briony looks like the actress from Motherland. 3. I didn’t particularly warm to Ruby. 4. Kim-Joy was a bit tryhard fey. 5. There wasn’t any standout likable one for me but I guess that will change. 6. I’m delighted it’s back. Is it not may all your biscuits burn? Sorry, wasn’t trying to be pedantic. Just curious if you were referencing calcifer. There is nothing so disappointing as a burnt bake. True. It always happens. I’m going with *don’t look at her arm! * Briony for now.